We’ve entered a new age of eDiscovery: the world’s leading eDiscovery processing, review, analytics and predictive coding technologies are now combined to help you uncover better evidence faster and quickly integrate it into your strategy for litigation and regulatory cases. Combining the patented processing power of the Nuix Engine across more than 1,000 file types and data formats with Ringtail’s efficient review and automation capabilities creates an end-to-end eDiscovery platform without compromise. 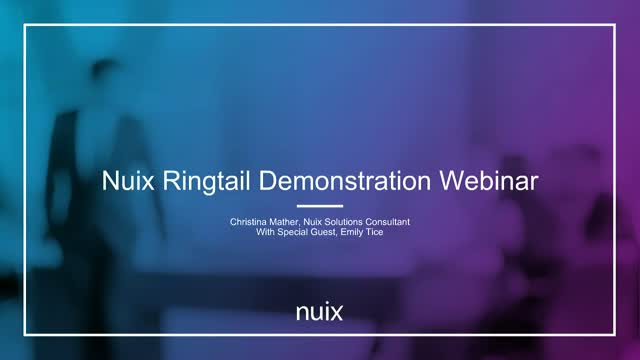 Join our industry experts for a Nuix Ringtail demonstration to learn how this completely scalable solution can limit your risk, save you time and reduce your overall eDiscovery costs. •Never miss a shred of evidence thanks to the industry standard in processing for eDiscovery and forensic investigations. Join us on Monday, 12 November, at 2pm (GMT) to see why. Organizations are faced with growing and increasingly complex privacy regulations but looking at the market you only see myopic and mono-disciplinary solutions. In this webinar, we will demonstrate how you can align a proactive information governance approach with a robust and focused cybersecurity solution. Along the way, you will learn how you can use the Nuix tools for cleanup, organization, discovery, investigation, classification, and protection to solve for more than just data protection. The increasing frequency of major breaches and the introduction of government regulations such as Europe's General Data Protection Regulation is prompting organizations to re-examine their incident response programs and focus on enhanced detection and accelerated response. To meet today's challenges, organizations require tools that can detect the most advanced attack techniques, enable rapid breach investigations, provide remediation capability, and preserve evidence for downstream investigations and reporting. During this webinar, Hoke Smith, Director, Cybersecurity & Analytics at Nuix, will demonstrate how to detect, investigate, and respond to a breach within 72 hours. He will also show you how to maintain collected evidence as part of a legally defensible case. Join us at 10am (EST) 3pm (GMT) on Tuesday, 29 January 2019 to learn how to boost the effectiveness of your incident response program. Hoke is responsible for implementing cybersecurity and analytics solutions for Nuix customers. He has more than 20 years’ experience solving complex technical problems for large organizations. Before joining Nuix, Hoke managed insider threat and big data analytics programs at IBM, primarily for defense and intelligence organizations. His areas of expertise include endpoint security, counterintelligence, insider threat detection, optimizing organizational performance, and big data analytics. Staring at a progress bar is nobody’s idea of a good time: Investigation, discovery and information governance tasks often involve complex workflows that you must complete consistently and repeatably. Traditional approaches—such as detailed process manuals, custom scripts, third-party applications, or just staring at the progress bar—all have hidden costs in time, money, inconsistency, and potential for errors. Nuix Orchestration is a web-based multi-user graphical tool that allows you to map out complex data processes across multiple activities and machines and let them run with minimal user input. It gives you the “easy button” to optimize resource utilization, manage changing priorities, and maintain consistent workflows. Help you achieve greater efficiencies, manage resource utilization, optimize processes, and shift priorities from a collaborative web-based platform. Streamline many repetitive tasks such as processing, search and tag, exclusions, OCR, production sets and legal exports into easy-to-use workflows. Maximize throughput by queuing tasks across multiple servers overnight, eliminating the need to wait around for one process to complete so you can feed the results into the next. Minimize errors and rework, creating detailed templates and workflows with consistent settings applied to each activity, greatly reducing the opportunity for human error and the need for costly rework. Smart corporations bring eDiscovery software in-house to reduce outside counsel and service provider spend. Smarter organizations look for opportunities to use this same software to identify risk, achieve compliance, and enable effective governance. Nuix now offers fast, modern, end-to-end software for legal hold, collection, processing, early case assessment, review, analysis, and production. See through several different scenarios how our software gets you to the critical information and results you need to anticipate, detect, and act on eDiscovery, risk, and compliance events. Our latest release is designed to give eDiscovery professionals, legal operations, lawyers, investigators, information governance professionals, and law enforcement additional freedom and functionality to automate and simplify their workflows. Users will find it easier to add, organize, and share information within and across cases, incorporate social media into investigations, and load and process files with additional data inputs, bulk load capabilities, and workflow templates. Corporate crime costs the US economy $50bn a year – a risk your organization cannot afford to ignore. Digital data, bring your own devices, the use of social media in the workplace, and a mobile workforce, leaves your organization open to employee misconduct. In this webinar we’ll show you how to avoid the costs associated with external providers by detecting fraud using in-house resources. Most enterprise security stacks are comprised of dozens of complex disconnected tools, yet the gaps between these tools remain and threats get through. An emerging class of endpoint products offers the potential to simplify enterprise security architecture and at the same time reduce the risk of both external and internal threats. This webinar will demonstrate how Nuix Adaptive Security drives security-tool convergence by helping organizations detect malicious insiders, find advanced threat actors who evade traditional defenses, and give security operators a faster, more efficient means to respond and remediate incidents with a single piece of software. Are you a Nuix user who’s interested in learning ways to increase efficiency and create more value? The team will wrap up the webinar with a short Q&A session that will allow you to further engage and ask any remaining questions that you might have. Do not miss this opportunity to learn practical tips and tricks from Nuix and industry experts. Investigative teams are under increasing pressure to respond to challenges caused by greater volumes of data and a more diverse range of digital devices. Key facts are often spread across multiple evidence sources, making it difficult to understand the bigger picture and often requiring an investigator to manually correlate their findings and identify connections. This places an increasing burden on overstretched teams, who need to respond faster and with more accuracy. Join Stuart Clarke, Global Head Security & Intelligence at Nuix who will introduce collaborative and intelligence driven investigations that can augment human investigative skills and expose the hidden relationships across people, objects, locations and events. Stuart is an internationally respected information security expert who is responsible for the overall security and intelligence strategy and delivery at Nuix. During his time at the company, Stuart has advised the United Nations’ peak cybersecurity body ITU and provided cybersecurity training for over 60 computer emergency response teams. He led the development of Nuix Investigation & Response, an innovative investigative tool used to delve into the causes and scope of data breaches. Has your IT department recently purchased Office 365? Is your team thinking about adopting the new technology? Discover what data you should move to Office 365 and why it matters to you in this interactive, free webinar in Lighthouse’s Office 365 series. Mo Ramsey, General Manager of Global Advisory Services at Lighthouse, and Alex Chatzistamatis, Principal Solutions Consultant at Nuix will cover diverse ways for you to move data and remediate risk, as well as key considerations to take when making the move. They will also dive into how the Nuix Engine may be used during this cumbersome process, its many capabilities, and key benefits. The team will wrap up the webinar with a short Q&A session that will allow you to further engage and ask any remaining questions that you and your team may have. Do not miss this free opportunity to learn practical tips and tricks from industry experts. After months, and years, of talking about it, the 25th May 2018 has come and gone meaning the EU General Data Protection Regulation (GDPR) is now in force. But what does that mean for organisations around the world? They are now faced with having to adjust their business practices to ensure compliance to the legislation given to data subjects – yet in seems that no one is ready or many have underestimated the extent of the organisational changes that lies ahead. We have already seen many news websites be taken offline for European audiences under the GDPR rules and the big player of Facebook and Google already accused of breaching the framework. It is only a matter of time before EU data subjects begin to fully exercise their rights, such as Subject Access Requests (SAR). How could you cope with the pressure of responding to these requests? There Is a silver lining. In this webinar, we review some practical steps that your business can take to address GDPR concerns, specifically when dealing with data subject requests. •Explore practical steps that businesses can take to address their GDPR data requirements. •Outline ways to improve costs and man power to address business GDPR issues, such as responding and producing subject access requests. The second edition of The Nuix Black Report has been released including new insights and information on the source of the threat, the attackers and penetration testers themselves. Join Chris Pogue, Head of Services, Security and Partner Integration, discuss the true nexus between attacker methodology and defensive posture in this live webinar. 2. What’s the best spend for your security dollar and why? 3. If hackers could speak to your organization’s leaders, what would they say? Organisations are still worried that they may still be open to GDPR legal issues and legal interpretation. Join our speakers Nick Pollard, Nuix and Gareth Atkinson, StartRiskLab who will explore where you should be right now with your GDPR preparations. It takes minutes to get inside. Days to exfiltrate. Detection can take weeks, maybe months. The impact is huge: lost revenue, increased costs, and damage to your organization’s brand. You can’t completely stop breaches from happening, but you can remediate the direct and indirect costs they can have on your organization. By taking a proactive stance, you can properly plan and budget for the costs associated with a breach. Through early detection and rapid response, you can obviate the need to notify affected customers and reduce the costs associated with notification. • How early detection and rapid response can drive down the cost of a breach. Harlan began his career in information security 28 years ago. After serving on active duty with the United States military, he transitioned to planning, coordinating, and executing vulnerability assessments. He then went on to digital forensics and incident response, which in turn led to targeted threat hunting and response. Everyone’s been compromised. Financial services companies should just assume that’s the case. Yet, many companies still don’t have effective programs or inter-departmental policies and procedures in place. They measure the time it takes to identify a breach in months, sometimes years, and fraudulent transactions often go uncaught. However, there is hope. We will examine three distinct cases of financial fraud and, using investigations, eDiscovery, and cybersecurity tools in new ways, demonstrate how you can minimize your risk and limit the damage done to your organization. • How to expand their use of traditional forensic, eDiscovery, and cybersecurity tools to shorten the time criminals have to operate. Keith has more than 25 years of experience implementing, managing, and directing insider threat, counterintelligence, and intelligence collection programs. He is a former law enforcement officer and High-Technology Crime Unit detective with the City of San Jose California and a United States Navy Mobilized Reservist. He also served as Chief of Staff to the Deputy Under Secretary of Defense for Human intelligence, Counterintelligence and Security at the Pentagon. Peter is a Senior Information Security Consultant at Nuix. He has more than ten years’ experience in federal law enforcement and another ten years’ experience as an Information technologies and radio frequency engineer. While working in law enforcement, Peter was detailed to the Electronic Crimes Task Force and was the lead forensic investigator on many computer crimes, network intrusions, and wireless exploitation cases. For as long as there has been commerce, there has been espionage. Although the medium for the theft of data may be as prosaic as a USB device, the impact of the loss of sensitive information can be financially devastating for the victim. In contrast, the intrinsic value of the information stolen may be completely disproportionate to the reputational damage caused if the outside world perceives that the organisation concerned failed to take adequate steps to prevent such leaks. Espionage takes many forms and can range from a simple swipe of client data by a departing employee through to a sophisticated data grab of business critical documents. Well-placed insiders, covert meetings, secret world-changing technology, and huge sums of money changing hands—sounds like the latest spy novel, right? But it’s not; this is a true story, where data is the main character in the Waymo vs Uber case. Data is an organization's most valuable asset. Just ask your most determined adversary, keen on stealing your intellectual property for financial gain. Do you have the right strategy in place to protect your critical value assets? If that plan doesn’t include a system and process that gives you 360-degree visibility into users’ behavior, and links those behaviors with network data, emails, texts, digital, social media, and mobile forensic artifacts, you aren’t as protected as you think. The Waymo vs Uber case offers us a valuable, real-world situation to learn from and guide our own practices. Join our CTO, Stephen Stewart, and SVP and former naval intelligence officer Keith Lowry, to learn how organizations are combining traditional investigations, eDiscovery, and cybersecurity tactics to defend their organizations from insider threats. How organizations can gain a 360-degree investigative view of their environment, and be ready for their next digital threat.